New York City’s heavyweight restaurants were once all about their opulent settings and glorious views, even with a star chef in the kitchen. Dinner in those days—we’re talking Manhattan’s rip-roaring, pre-9/11 era—could be a full-fledged event, before picnic benches replaced velvety armchairs, back when caviar still trumped rooftop kale. 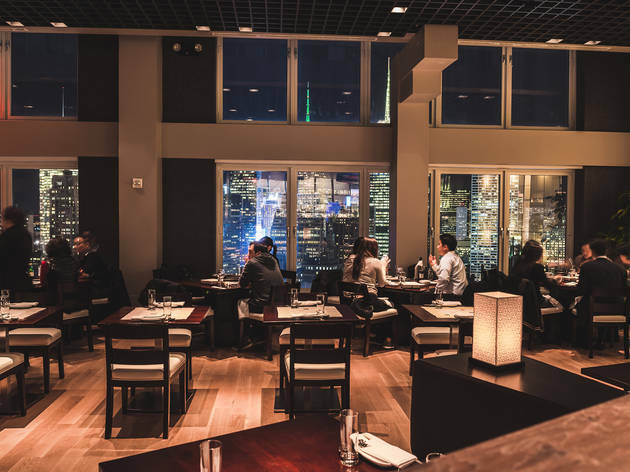 At high-rise hot spots like Windows on the World and the Rainbow Room, the food could be terrific or awful, but either way those top-of-the-world dining rooms would be packed with hobnobbing patrons dressed to the nines. 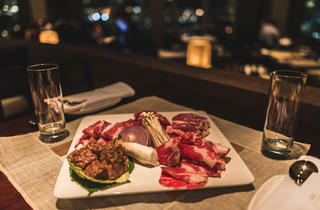 Gaonnuri, in that context, is a serious throwback: the first restaurant atop a skyscraper to open in ages, thanks to a $5 million investment from its financier owner. Located on the 39th floor of a Koreatown tower, the sleek space offers some amazing sights of a twinkling skyline—newly appreciated post-Sandy—through its wraparound windows. But the cooking, it turns out, is spectacular too. 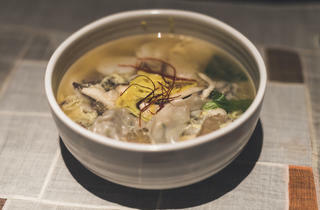 The Korean classics are among the best in the city, and, refreshingly, at not much more than sea-level prices. 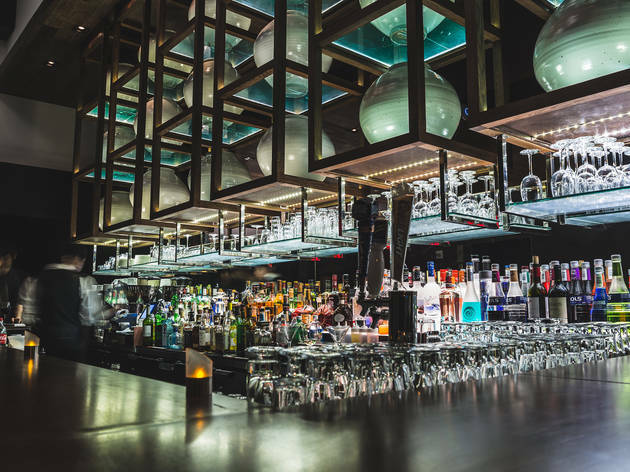 The kitchen—run by Tae Goo Kang, a Korean who’s cooked Japanese at Nobu 57 and French at the Modern—highlights grade-A ingredients and upscale presentations. Along with an oversized pajun, the ubiquitous seafood-scallion pancake, you can get a sampler of fluffy miniatures, delicately flavored with beef, fish or vegetables. 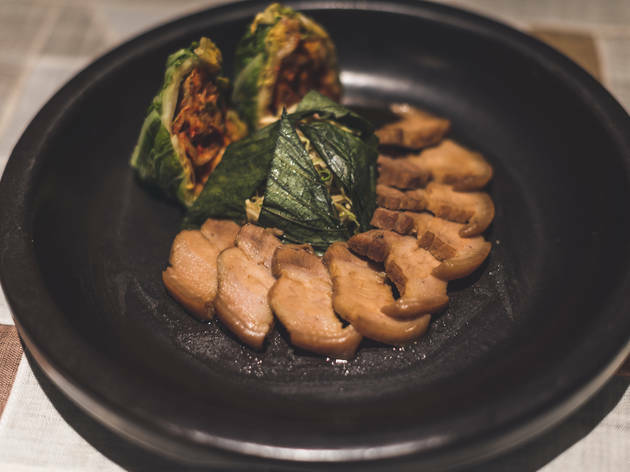 Succulent slabs of pork-belly bossam come with minty perilla (a heady Asian herb) and bundles of red and green kimchi. 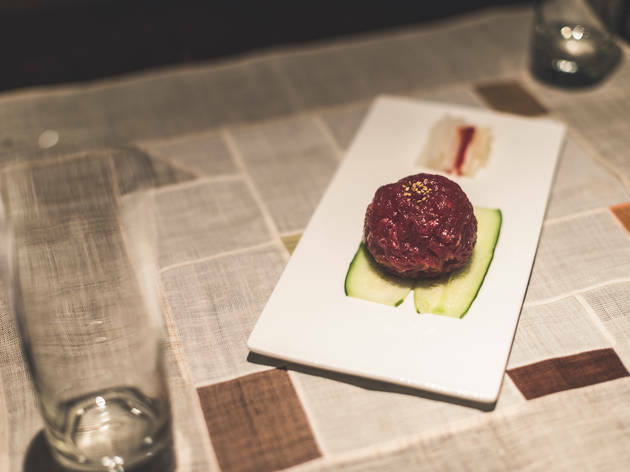 Korean beef tartare, another top-shelf starter, features semi-frozen shreds of pristine raw beef beautifully seasoned with sesame oil, soy and sweet Asian pear. Tabletop barbecue, centerpiece of a typical Korean night on the town, is the focus here too. 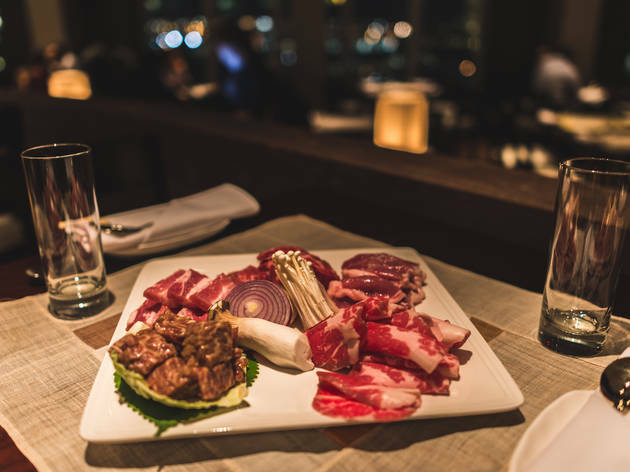 The unusually large roster of proteins includes thick duck breast pieces, big tiger shrimp, tender boneless short ribs (kalbi) and shaved fatty brisket. Attention to detail—the raw materials are exceptional—makes the difference. 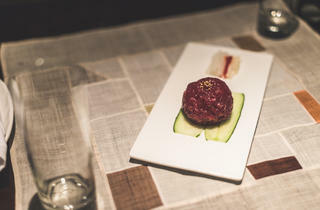 The chef is just as exacting with his composed plates and stews. 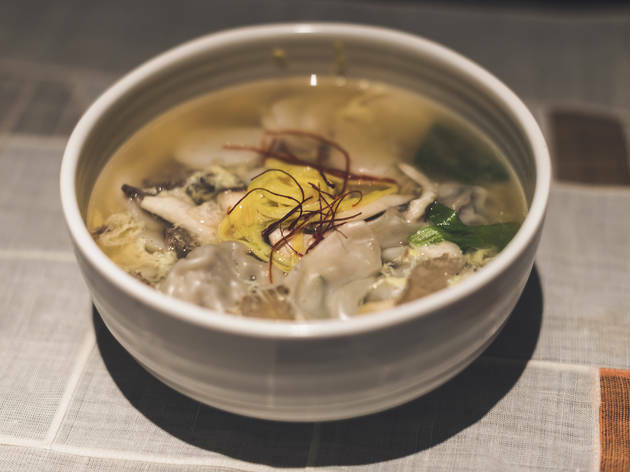 The dduk mandoo guk, a rustic mix of velvety beef broth, sliced brisket, rice cakes and juicy beef dumplings, is a terrifically restorative meal in a bowl. 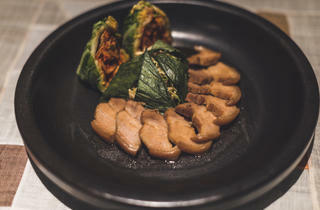 Buttery black cod, marinated in Korean miso, is the equal of its better-known Japanese cousin (a Nobu signature dish). It’s a pity then that equal attention isn’t paid to the service: The disorganized waitstaff can be awkward and absent, delivering everything with assembly-line speed, then vanishing for ages. Proper pacing is a problem here, so request a hold on the entrées until you’ve polished your starters off first. 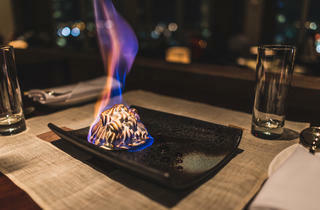 Desserts though, a Korean restaurant rarity, are as ambitious as the dining room’s sky-high setting. 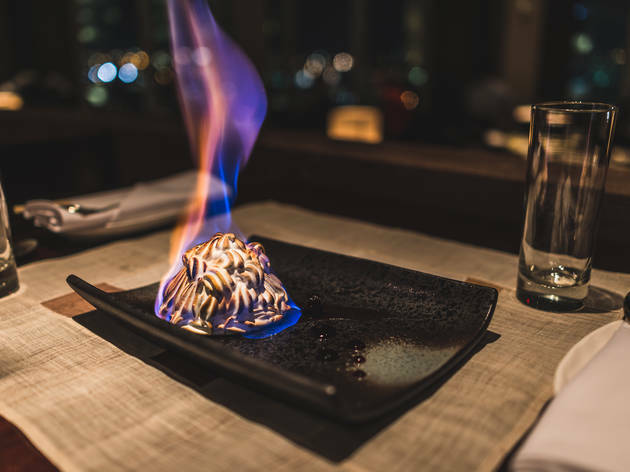 Pastry chef Sun Geum Kim, who’s done time at Daniel, prepares elegant crowd-pleasers like an haute “Snickers bar” with peanut cremeux and an excellent boozy baked Alaska, ignited tableside. The sweets exceed expectations, like so much of this extravagant enterprise. You might even say they live up to the view. Drink this: Apart from a few alarming sweet cocktails, the libations are pretty standard for a Korean restaurant. Chamisul Soju ($16 per small bottle), the fruity Korean rice vodka, goes down easy—great for toasting the view—but, at 19 percent alcohol, it packs a stealthy punch. There’s also OB beer ($8), the light lager from Seoul that’s a Korean barbecue standby. 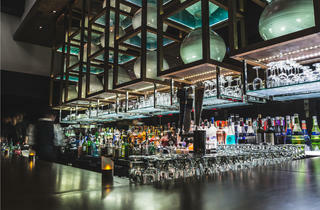 Sit here: Every seat offers scenic panoramas, although the tables closest to the windows are prime. Conversation piece: Gaonnuri translates as “center of the world.” Its owner insists it’s the highest Korean restaurant on earth. 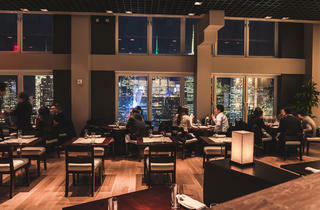 Great views of the city in this midtown gem, not to mention great food. Came here for a friend's birthday. The view is great! The food is a bit pricey though.